A gate provides a safe break in electric fencing for access for you and your animals. 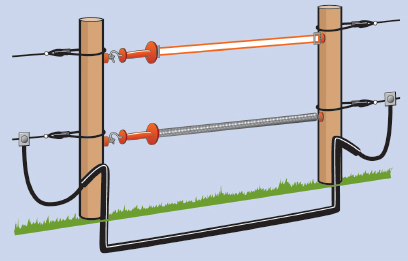 An electric fence gate requires several components. 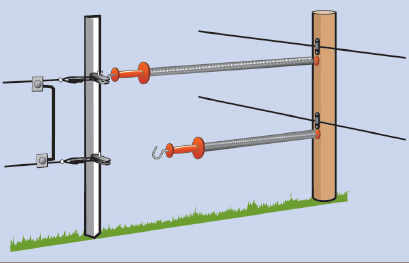 An insulated gate hook and attached tape or spring provide the barrier across the gateway; a gate insulator maintains the electrical connection from the fence to the gate; and an insulator on the opposite post prevents the power from the gate line leaking back to ground. You can buy these components separately, or in a kit form such as our Spring Gate or Tape Gate. These contain everything you need to make a gate in any temporary or permanent electric fence line. In a permanent electric fence you should use heavily insulated underground cable to provide the power link across the gateway. When you open the gate, the power is disconnected from the gate line itself, but remains connected to the fence line via the underground cable. Don't use ordinary electrical wire as the insulation is insufficient to withstand heavy traffic, and will perish over time. If the cable could be damaged by sharp stones, bury it in a rigid plastic pipe and bury it at least 30cm deep. Turn the ends of the pipe down to keep out water. In temporary electic fencing, you should have one gate only, and place it at either end of the fence line. This means that the electric fence is always energised regardless of whether or not the gate is open, and the gate itself is energised only when closed.